It seems only right to start out National Ice Cream Month by discussing the ever popular, mother of all classic flavors – vanilla ice cream. As much as I do enjoy rich, over the top flavors of ice cream, I think it’s tough to beat a scoop of really good vanilla bean ice cream. It is creamy and delicious all on its own, but also makes a wonderful base for fun toppings such as caramel or hot fudge sauces (both recipes to come), and is equally welcome aside a slice of pie or cake. Since investing in my ice cream maker four years ago, I have not bought a single container of ice cream from the store. Making your own is easy, fun and the results are so much better, you won’t be tempted to return to store-bought. 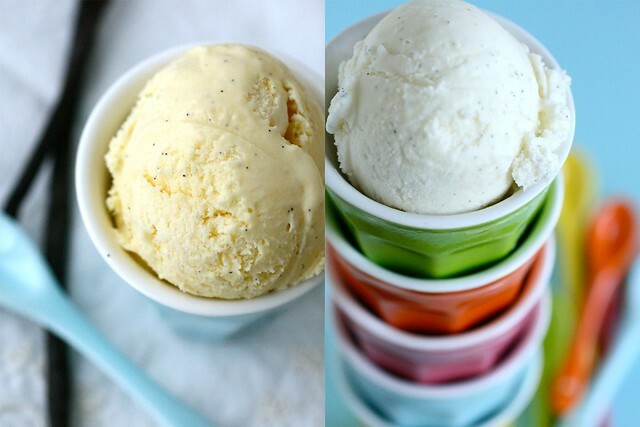 If you are new to ice cream making, these two recipes will help you learn some of the basics. Varieties of ice cream generally fall into two main categories: Philadelphia-style or French-style. Philadelphia style ice creams are quicker and simpler, with a heavy cream/milk mixture for the base. 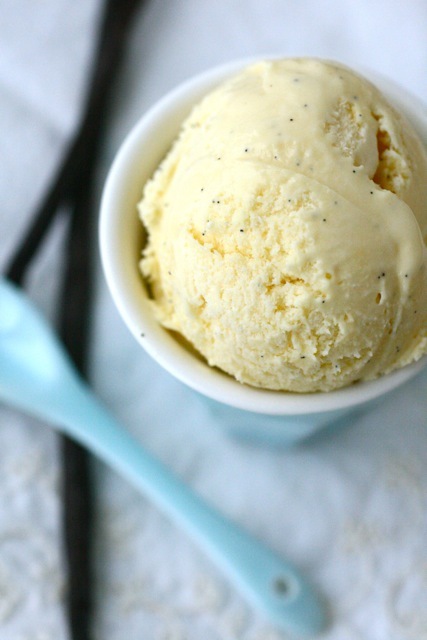 French-style ice creams have a custard base, with cooked egg yolks to help achieve a creamy texture and rich flavor. I recommend Philadelphia-style recipes for first-timers if you are unfamiliar with making custards. It really isn’t complicated but I think it’s good to start out simple and build from there. I’ll be completely honest and tell you that I don’t have a favorite between these two versions. Every time I make one of them I think, “This one is definitely my favorite!” and then I make the other variety and, surprise, I think the same thing about that one too. I usually decide which one to make based on whether or not I have leftover egg yolks in my fridge and whether or not I have any time constraints. If you opt for the French-style version, the most important thing is to use an instant-read thermometer while you make the custard base. It takes all the guesswork out of ice cream making. Be sure to add the hot cream mixture to the eggs slowly, whisking constantly the whole time. This is known as tempering the eggs and will prevent them from curdling when you stir in the hot liquid. The other key point is that the eggs will scramble at about 180˚ F, so you want to aim for 170-175˚ F and then remove the mixture from the heat. If you overshoot a bit and have a few bits of scrambled eggs, don’t worry – this is why you pour the mixture through a mesh strainer and ensure that it stays completely smooth. I’m on vacation this week but stay tuned next week for an ice cream-related giveaway as part of our continuing celebration of National Ice Cream Month! Combine 1 cup of the cream with the sugar and salt in a medium saucepan. Scrape the seeds from the vanilla bean into the pan and drop in the vanilla pod. Heat over medium-high heat, stirring occasionally, until the sugar is dissolved. Remove the mixture from the heat and stir in the remaining 1 cup of cream, the milk and the vanilla. Cover and refrigerate until the mixture is well chilled. Remove the vanilla bean before churning. Freeze in an ice cream maker according to the manufacturer’s instructions. Pour the remaining cup of cream into a bowl and set a fine mesh sieve over the top. In a separate medium bowl, whisk the egg yolks until smooth. Slowly pour the warm milk mixture into the bowl with the egg yolks, whisking constantly. Return the entire mixture to the saucepan and place over medium heat. Cook, stirring constantly and scraping the bottom of the pan, until the mixture thickens slightly and coats the back of a spoon (about 170˚-175˚ F). Pour the custard through the mesh strainer into the bowl with the cream. Stir in the vanilla. Let cool slightly, then cover and refrigerate until completely chilled. Remove the vanilla bean before churning. Freeze in an ice cream maker according to the manufacturer’s instructions. 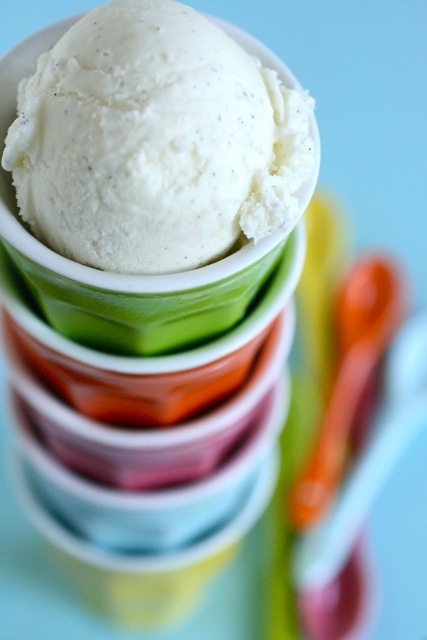 Storage – You can store your ice cream any way you like as long as it is an airtight method in your freezer. I like to use tupperware-type containers but have also used loaf pans with plastic wrap over the top. Fat content – Don’t be tempted to substitute a lower-fat component such as reduced fat or skim milk rather than what is called for. The higher fat content of heavy cream, half-and-half, and whole milk provide a creamy texture and also prevent ice creams from freezing too hard. A lower-fat substitute will result in a very icy texture because it has more water and less fat. Hard freezing – Some homemade ice creams may freeze a bit harder than the store bought variety. David Lebovitz has an excellent and informative post on this topic with good explanations and troubleshooting tips. Vanilla beans – Buying vanilla beans in ones or twos at the grocery store is very expensive. Buy vanilla beans in bulk. It is much more economical, not to mention you’ll have them around for all sorts of other wonderful things like vanilla bean cupcakes, cookies, vanilla extract (recipe to come) and more. I buy them on Amazon and they last me quite a long time, even with the amount of baking I do. 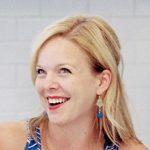 Ice cream makers – People frequently ask me for ice cream maker recommendations. I’ve only tried one version so it is the only one I can speak to. I have the KitchenAid Ice Cream Maker attachment and I absolutely love it. I think if you already have a KitchenAid mixer base, this is the way to go. If not, I know a lot of people really love the Cuisinart freestanding model. To me the KitchenAid attachment makes the most sense if you already have a mixer base because it is not an additional piece of equipment taking up valuable real estate in your cabinets (my bowl lives in the freezer so it is ready to go any time the ice cream making mood strikes). Egg whites – Went with the French-style ice cream and now you have left over egg whites? Some of my favorite ways to use egg whites include French macarons, Swiss meringue buttercream, semifreddo, or marshmallow frosting. You can also use them as egg wash for baking bread or as coating for chicken Parmesan.